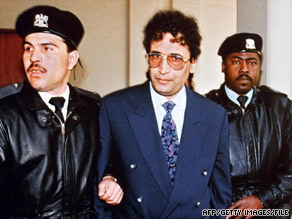 The only man ever convicted over the Lockerbie passenger plane bombing was Thursday released and allowed to return to Libya on compassionate grounds because he is terminally ill.
Abdelbeset Ali Mohmed al Megrahi 57 was serving a life sentence for bombing Pan Am Flight 103 over the Scottish town of Lockerbie, resulting in the deaths of 270 people. The White House, which has urged Britain to keep al Megrahi behind bars, said it “deeply regrets” the decision. Scottish Justice Secretary Kenny MacAskill told a news conference that the prisoner, who doctors say has three months to live, was “going home to die” and would be put on a plane later Thursday. “Our justice system demands that judgment be imposed but compassion available,” MacAskill said. “Our beliefs dictate that justice be served but mercy be shown.” The justice secretary said he declined to allow al Megrahi to be transferred to Libya to serve out his sentence, even though a prisoner transfer agreement exists between the United Kingdom and Libya. The Pan Am flight exploded December 21, 1988, as it flew over Lockerbie, Scotland on its way from London to New York. All 259 people aboard the plane died, along with 11 Scots on the ground. Families of the victims have been divided on whether al Megrahi should be ever be released. The United States has made clear to the British government and others that it believes al Megrahi should spend the rest of his time in jail. In a statement released shortly after Thursday’s announcement, the White House said it “deeply regrets the decision”. “As we have expressed repeatedly to officials of the government of the United Kingdom and to Scottish authorities, we continue to believe that al Megrahi should serve out his sentence in Scotland,” it said. MacAskill said he believed the United States government and American families of the victims were led to expect before al Megrahi’s trial that whoever was convicted would serve out their entire sentence in Scotland. “They did so on the basis of agreements they said had been made prior to trial regarding the place of imprisonment of anyone convicted,” MacAskill said. “The U.S. attorney general, Eric Holder, was in fact deputy attorney general to Janet Reno at the time of the pre-trial negotiations. He was adamant that assurances had been given to the U.S. government that any person convicted would serve his sentence in Scotland.” The United Kingdom declined to back up those claims, leading MacAskill to side with the American position, he said. Al Megrahi was convicted in 2001 after the prosecution argued he had placed the bomb, hidden in a suitcase, on a flight from Malta to Frankfurt, Germany. There, prosecutors said, the bomb was transferred onto the Pan Am plane that went first to London’s Heathrow Airport and then took off for New York. Another man — Al-Amin Khalifa Fahima — was also tried in the bombing but was acquitted. The prosecution maintained al Megrahi, who worked at Malta’s Luqa Airport, was an agent for the Libyan intelligence services and had been seen buying clothes that were in the suitcase that contained the bomb. Libya has formally accepted responsibility for the bombing and has compensated the families, though Libyan leader Moammar Gadhafi later denied any culpability.